Guests to Grand Canyon National Park will see almost two billion years of the earth’s geological history within its steep walls. According to most geologists, the Colorado River began carving the canyon at least 17 million years ago. This river erosion and formation continues today, as the Grand Canyon totals 277 miles long, 18 miles wide and an average of 1 mile deep. Since being established in 1919, Grand Canyon National Park has grown to cover 5,219 square miles, which includes a South Rim and North Rim on either side of the Colorado River. With dozens of hiking trails, various museums, park ranger presentations, helicopter tours, campsites and more, guests could easily spend several days at the park. However, Las Vegas is close enough to enjoy a long day trip to the canyon. 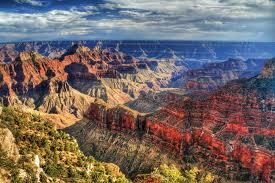 Grand Canyon National Park is located 280 miles west of Las Vegas in Northern Arizona. Depending on which rim you travel to, a day trip can last eight to twelve hours. While most of that time is spent driving, there are several great stopping points along the way, including the Hoover Dam, various gift shops and Route 66 in Williams, Arizona. For those who don’t want to drive themselves, there are numerous tour guide companies that operate day-long bus trips to the canyon. These tours usually feature knowledgeable guides, hotel pick up/drop off and lunch. Various companies offer flights to the South Rim from Las Vegas. The South Rim receives 90 percent of the park's visitation and is unquestionably the most developed area to visit. It is about four hours from Las Vegas. Upon entrance to the South Rim, guests will find the Grand Canyon Village, which is home to three information centers, several gift shops, a market, two lodges and lots of parking. Visitors should take advantage of the park’s bus system, which provides convenient transportation across the South Rim. Some roads are off limits for personal vehicles. This includes the Hermits Rest Route, which offers several gorgeous views and is navigated by park shuttle buses. One of the most popular spots to first view the canyon is at Mather Point. It can be packed with dozens of people during busy hours, but the guard rails help protect from accidents. From this lookout, you can stroll along the Rim Trail. This paved pathway is great for those who wish to avoid strenuous hikes. Less than a mile from Mather Point, one will find the Yavapai Point and Geology Museum. Here, guests can learn about the history of the Grand Canyon and catch periodic presentations by park rangers. Within the Grand Canyon Village, you’ll also find the mule stable for canyon tours. These guided trips are a fun way to travel inside the canyon, but reservations fill up fast. They can be booked up to 13 months in advance, so plan ahead. Rides run from three-hour tours for $128 to overnight adventures for $550. Of course the cheaper alternative is to hike into the canyon on foot. The South Rim offers three corridor trails into the canyon. As you will see on signs at the trailheads, the park does not recommend hiking down to the river and back in one day. Most of the approximately 250 people rescued from the canyon each year are fit individuals who overexert themselves. The North Rim is located directly across from the South Rim on the other side of the river. Because the North Rim is about 1,000 feet higher in elevation, most guides claim the views are actually better from the south. 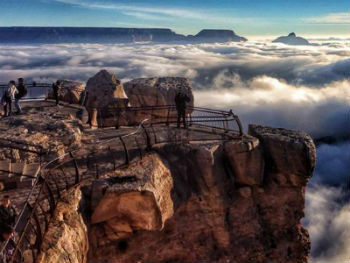 For this reason, the South Rim is generally a wiser choice for first-time visitors. However, the North Rim does have a unique rustic charm and is much less crowded. This remote charm is evident from the five-hour drive (North Rim does not have an airport) that goes through bumpy roads in Utah and Arizona. 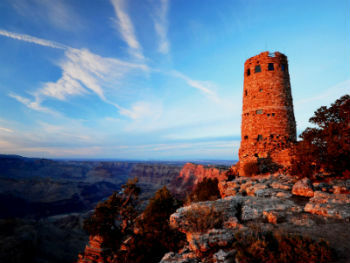 The North Rim appeals to many visitors do to the historic Grand Canyon Lodge and a larger variety of trails. Experienced hikers can hike down the canyon from the North Rim and come up the South Rim. Sometimes called the “West Rim,” Grand Canyon West is operated by the Hualapai Indian tribe on reservation land and is not a part of Grand Canyon National Park. The most popular option for visiting the West Rim is with a helicopter tour. This destination is much smaller than the national park but it is closer to Las Vegas (less than a three hour drive) and offers an airport, food services and limited lodging. The most notable attraction at Grand Canyon West is the Skywalk, a transparent horseshoe-shaped walkway suspended over the canyon. Tickets range from $40 - $80. With nearly 5 million annual visitors, Grand Canyon National Park can get crowded during the spring, summer and autumn months. Thankfully, the park is big enough that you’ll rarely have to battle other guests for excellent views. To beat the crowd, visit in winter, early spring or late fall. Since much of the park is over 7,000 feet in elevation, guests can expect a variety of climate conditions. The canyon can range from hot and dry in the summer to cold and snowy in the winter. Nights can get especially chilly, even on sunny days, so plan accordingly and dress in layers. The bottom of the canyon can be over 20 degrees warmer than at the top, so hikers should be especially careful. Snow storms can sometimes close access roads, so remember to check weather conditions before arriving. The South Rim is open year round; however, the North Rim is only open from October 15 to May 15 of each year. The South Rim offers a variety of lodging options, from simple cabins to more luxurious rooms at the Bright Angel Lodge and El Tovar Hotel. In total, there are six lodges inside the park, with rates ranging from $83 to over $450 a night. Rooms tend to fill up fast, so visitors should book as far in advance as possible. If there are no adequate rooms available inside the park during your stay, there are several motels and an RV park located within an hour’s drive of the South Rim. The most reasonable rates can be found at the motels in Williams, Arizona, which is about 50 miles south of the park entrance. The South Rim has 13 dining options, which include two upscale restaurants, a bar, two cafeterias, a pizza pub and various snack bars. There is also a grocery store inside the Grand Canyon Village. Just outside the park in the community of Tusayan, there are another 15 dining options, including a McDonalds and Wendy’s. 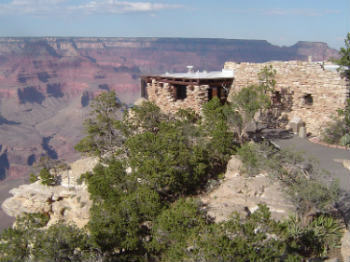 Lodging and dining options are much more limited at the North Rim. The only hotel within the park is the historic Grand Canyon Lodge, which offers rooms May 15th through October 15th of each year. There is another lodge 18 miles north of the park that also offers rooms on a seasonal basis. As far as dining options at the North Rim, there are four restaurants and one supply store.